Lost, Saved, Baptized, Rinse and Repeat. Have you ever heard anyone say, “I got saved and baptized when I was a kid, but then I walked away from my faith, and now that I’m an adult, I have come back?” Then, they get baptized again and share their testimony. After a few months of being, “back” they walk away again/backslide. A while later they decide they need to recommit their life to Christ, so they come back to Church and get baptized again. I don’t know how many times, in the Nazarene Church I attended, I heard someone say this, but it was a lot. I didn’t know how to understand this then. I didn’t have the Biblical knowledge to know this was wrong. I knew it was wrong intuitively, but couldn’t build a case Biblically. I struggled with this myself. Was I really saved that time when I was 19? If so, why am I still fighting these temptations to sin in my life? The Nazarene Church taught, “Entire Sanctification” back then. It was a doctrine that said it was possible for a person to mature spiritually, in this life, to the point where they no longer sinned. I got so frustrated with my constant failings. I cried out to God and told Him, “I can’t do it! I can’t stop sinning! If You want me to stop you are going to have to stop me!” So then came about a 10 year period where I gave up fighting the sins that were too hard to stop on my own. Sure I gave the outward appearance of being a Christian when I was at Church, but at work I still acted like a child. I used profanity all of the time, I told dirty jokes, I engaged in low humor, I entertained hateful thoughts against others because of their political beliefs, and I liked what I saw on television, except I would still cringe when a show used blasphemy. I knew I was doing wrong. I knew from what the Bible said, I was doing these things because my heart desired to do them. I also knew in my head that I didn’t want to keep doing them. The Church also taught that you could become apostate or lose your salvation if you continued to sin after being saved. This was the doctrine of, “Apostasy.” I remember asking the Pastor about what it said in Hebrews 6, about not being able to be saved after losing your salvation by continuing in willful sin. He explained that was correct. I asked him how anyone can stay saved if that was true. Another person quoted the passage about forgiving 70 times 7. They were trying to tell me if I repent, Christ will keep forgiving me, but if I didn’t repent, and then died, that I would go to hell. All of this didn’t jive with what I was reading in the Bible. It seemed as if people were just cherry-picking passages out of the Bible to justify the way they wanted to live. The denomination had its own definition of sin. I couldn’t justify it with what I had been reading in the Bible. I knew I was a sinner. I knew I kept committing sins. I felt powerless to be holy like the Church said I must be. My best efforts kept failing. That is why I gave up. The Church said sin was a willful transgression of a known law of God. I asked, “What if I fell into traffic, looked up to see a truck coming, cussed, and then was killed before I could repent?” I was told that was just a mistake, not a sin. So I asked, “What if, I blasphemed instead of cussed, in the same scenario?” I was told I might go to Hell. I was having a difficult time understanding being saved if it was always precariously perched on the narrow ledge of my flawed capacity. I went down the roads of, “Easy Believism” and “Cheap Grace.” I rejected the doctrines of, “Entire Sanctification and Apostasy.” While I was confused and erring I still knew and was strongly convicted that this was not right either. There is something I am missing. I was going through a very difficult time in my life. I didn’t trust God with my money, I didn’t trust God with my marriage, and I proved I didn’t trust God by my actions. A good friend suggested I read the book, “Crazy Love” written by this, Chinese American Pastor from California, with a shaved head. I was not at all anticipating the affect it would have on me or my life. Francis Chan’s book was a kick in my guts. It wasn’t a cruel kick, but rather one that was used by God. He got my attention and exposed how I was lukewarm. I was going to be told, “depart, I never knew you.” It was also about the same time this new radio program was playing on the local A.M. station. This funny, yet serious man named, “Todd Friel” with, “Wretched Radio” kept chipping away at what I had been told by the Church, with truth from the Bible. He was presenting a Reformed view of soteriology. (salvation) It was rocking my world. I was also listening to a local theologian on the same station. His name was Matt Slick. At first I was like, “What’s with this clown’s name? Is he a used car salesman or what?” So I was curious. I went to his website, “CARM.ORG” I read many of his articles and listened to his program and Todd Friel’s program intently and found myself nodding in agreement with them. I got on the internet and watched video after video from Matt Chandler, David Platt, Paul Washer, John Macarthur, R.C. Sproul, Leonard Ravenhill, Martyn Lloyd Jones, and so on. It was like I had this table with a billion puzzle pieces on it, and I only had a couple of corners figured out with some clouds, and these two men were helping me put the pieces together faster than I had ever done before. One day after most of the pieces were put together it was like someone nudged the table and the remaining ones fell into place. It was one of those epiphany moments you have in life. I don’t want to forget to mention the affect that, “Witness Wednesday” on, “Wretched Radio” had on me. I heard Ray Comfort and Todd Friel presenting the real gospel message to people on the streets and on college campuses. I finally heard the gospel after 15 or so years of believing I was a real Christian. Instead of hearing, “You’ve got a Jesus shaped hole in your heart. Won’t you let Jesus in? God is a gentleman and won’t come in unless you ask Him. He is waiting at the door of your heart, won’t you let Him in?” I was in a state of shock. It was so simple. Why hadn’t anyone preached this to me before?!? Why? Why? Why?! I was so angry with the Church, my friends, and most of all me. How could I not get it? Faith and repentance! Du! What I had known to be the Christian faith was off by just a scant amount, it seemed Christian, but it was out of phase. Through all of these influences in the middle of my suffering, I heard about real saving faith and repentance that are granted by God. Faith I couldn’t force myself to have in 15 years of trying. Repentance I couldn’t force myself to do, and the effects of these two things. I found myself running headlong into a study of Reformed Theology, the Reformers, the Puritans, and God’s sovereignty. My wife would ask me if we could talk about something other than religion. My co-workers were probably wondering what was going on with me. I would talk about my faith with everyone I met and share the gospel with them. I started evangelizing wherever I went. I actually read my Bible from cover to cover with a reading plan from R.C. Sproul’s Ligonier. I consumed scripture like I had never done before. The word of God became alive to me. Doctrine after doctrine fell into place in a harmony I had never before experienced in all of my piece-meal Bible reading. I’d be remiss, if I didn’t tell you about the great help Dr. R. C. Sproul’s book, “The Holiness of God” was to me. He corrected the low view of God, the high view of man’s abilities, and the marginal view of sin that I had. It fixed in my head how holy God is, how helpless man is, and how offensive sin is. With this knowledge firmly ensconced in my mind, I could finally put the false teachings behind me. You see, people don’t get saved and then lose their salvation. They don’t get resaved over and over again. You get saved ONCE! If your life isn’t characterized by growth in knowledge of personal sin and in holiness you aren’t saved. It never happened. Do you read your Bible regularly? Do you hate sin in your life, the sin you used to make room for? Do you love to go to Church and be with God’s people and worship Him together with them? 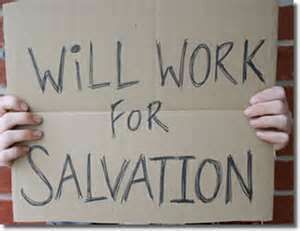 Do you trust Jesus alone for your salvation and righteousness? Do you love to do good works, not out of a sense of duty or obligation, but rather do… YOU… LOVE… to do the good things God has prepared for you to do before creation? A saved person is a new person. They are a different person. They have a different nature. They are born again. They died to themselves and were resurrected with Christ a new person. I never got this in all those years. I suspected there was more to this religion, but I couldn’t grasp it. I couldn’t comprehend it… yet! Then God worked a double miracle in my life of regeneration, and justification. I trust Him to complete the sanctification that He has started in me. I desire to be conformed to His word and will instead of shrinking from it. I love Jesus! I hope you will to. Watch the video to get the gospel presented to you.